Don't forget to leave us a Google Review! We are located in Elliot Lake, Ontario, and we launched our online store to further extend our inventory to our customers in Elliot Lake, Blind River, Cutler, Spanish, Thessalon, Iron Bridge, Webbwood, Spragge, Massey, Espanola, Sudbury ,Sault Ste. Marie & all along the North Shore, as well as our growing number of customers from all corners of Ontario, including Toronto. We have thousands of accessories for your ATVs, Snowmobiles, Side x Side's & Chainsaws. 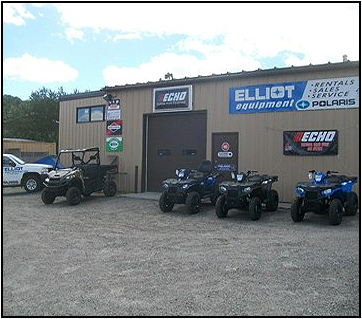 We invite you to browse through our online warehouse to find the best from Polaris, ECHO, Motovan, Gamma, Parts Canada & more. Looking for Equipment Rentals? Visit our Rental page to see our equipment & rates. If you don’t see what you’re looking for, contact us. We offer ATV, UTV, Snowmobile, and Chainsaw service and regular maintenance to all of our customers. Our service department offers performance tuning, minor and major repairs, routine maintenance, and more.